This doc refers to protocol.mainnet.json but the information can be applied commonly. Here, NEO-Python is configured to connect to seed1.neo.org, seed2.neo.org, etc. through PORT:10333. What happens if every node in our list is down? Neo-python is smart, so it will attempt to connect to neighbouring nodes. However, there are many unknown factors in this approach. Perhaps the neighbors are down. The wait time may be extended. 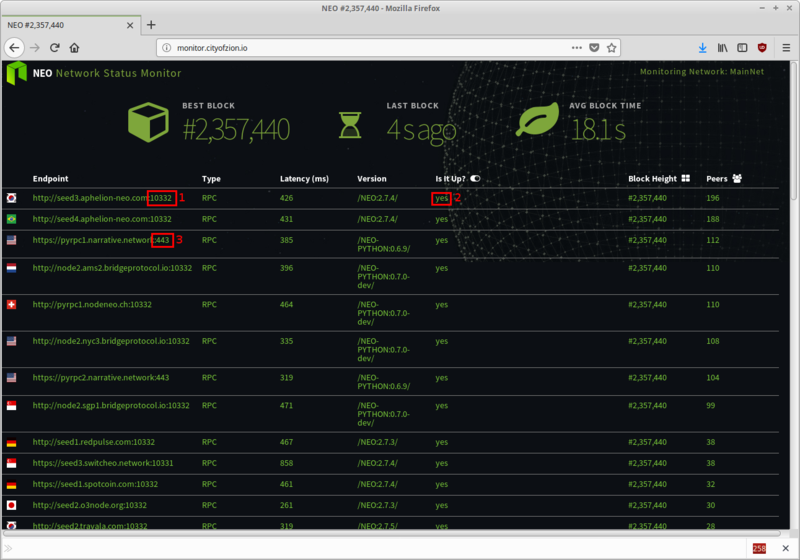 By updating the SeedList with addresses of nodes we are certain are alive, we can avoid lengthy wait times as described in Potential Problems. If you are running neo-python using Ubuntu, you are mostly likely using a venv. Make sure to update the protocol.mainnet.json (as applicable) within your venv located at lib/python3.6/site-packages/neo/data. If this path does not exist, you haven’t used it in your current venv and you can edit the file located under your neo-python folder at neo/data. Alternatively, you could delete your venv folder, edit the parent file, make a new venv folder (python -m venv venv), activate your venv, then reinstall using pip install e ..
How do we find out which nodes are alive? Use NEO Network Status Monitor. If you would like more information visit the NEO Network Status Montior repository. A list of nodes that are available are shown above. The latest ones are pushed to the top. 2 tells us if the node is responding. The preferable nodes are “up”, which is indicated by the green color and “yes”. We will choose the first node over the third node, since 1 adheres the convention and 3 does not. Notice that we’ve added :10333 to the end of each of the addresses, to tell NEO-Python to connect using the ‘P2P’ protocol. You can now start neo-python as usual. It is recommended that you update your seedlist prior to starting any API Servers to ensure maximum connections. For more information about API Servers visit here.